Once upon a time, family names were ever so common. Every Bill had a Billy. Mothers’ maiden names became firsts or middles. And in some circles, the idea of not naming your firstborn son after grandpa would have been just short of blasphemy. Those days are over, and for the most part, that’s a good thing. 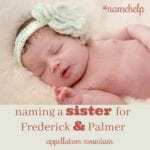 No one should feel pressure to use a name they don’t like, and there are lots of good reasons to forgo family names. But freedom in naming means that we’re also free to consider family names, whether that means that your Bill has a little Billy, or you take a more creative approach to honoring a loved one. And there are great reasons to do just that! Here are six of my favorites. Struggling to narrow down your 23 favorite names to just one or two? Stuck with no names on your short list, because you and your partner can’t agree on anything? Family names to the rescue. Even if you have a well-researched family tree stretching back generations, with branches and leaves galore, it’s still a small sample compared to the forest of potential baby names. When you discard those that feel impossibly dated or just not your style, odds are that you’ll have a short list that is truly, well, short. Not every family is straight out of Norman Rockwell, but if you have a reasonable relationship with your parents, there’s a good chance that they’re pretty darn excited about the arrival of another grandchild. And if that grandchild happens to have a family name? In most cases, that’s icing on the cake! 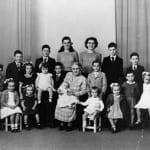 Speaking of grandparents, isn’t it staggering how quickly we forget our family’s history? I always wish I’d asked more questions. 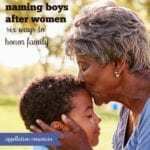 Bestowing a family name on your child is an invitation to learn more about his past. My mother has a family name, one that I handed down to my daughter. I love telling her about the way she’s connected, not just to her grandmother, but to her great-great-grandmother, too. Look far enough into your family history, and there are almost always some gems waiting to be discovered. Yes, there will be some inventions and oddities, too. A few names won’t feel quite right for today. But hidden among the family surnames and nicknames and given names will be at least a few usable ideas. Discovering those names? For many people, it’s a thrill. #2 – Who Can Argue? A few years ago, an acquaintance introduced me to her daughter. The baby’s name was clunky, not quite cool yet. (And my acquaintance was unaware of my name obsession.) “It’s a family name,” she added. Adding that bit about it being a family name was pretty darn genius. It’s much more difficult to be rude about a family name. You’d almost be insulting Great-Grandma Beulah or Uncle Reynaldo. Not that anyone should be rude about any name, ever. But the word family? It’s like the Get Out of Jail Free card in Monopoly. We’ve all heard the stats. 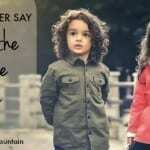 Some staggering percentage of parents regret the names they gave their children. While I have my doubts about those surveys, I do suspect that regret is less common when parents willingly use family names. Emphasis on willingly. If I’d been guilted into naming my son after my father-in-law, well … that would not be good. Happily, my father-in-law is one of the good ones, and I love seeing how much he and his grandson enjoy sharing a name. It makes the fact that we used a wildly common name far more bearable. Regret? Not an ounce. Because if your child’s name becomes the new #1 choice in the US, it’s still incredibly special. Lots of other kids might share the name, but none of them have your story. And if your child’s name remains rare, well … see #2! 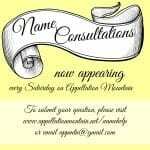 Would you use family names? Why or why not? We contemplated variations of family names for our daughters — Elena (Helen), Neda (Edna), Maria, Josephine, and Petra/Patrice (Peter) — but went another way. Had we had boys I think we would have used family names — Peter for my deceased FIL and Philip for my great-grandfather, maybe. My immediate family tree has some clunkers (Melvin, Edna), but going back their are some interesting choices: Jennie, Gregory, Simon, Holt, Minerva, Ruth, etc. Don’t be so hasty on the whole “Who can argue?” bit. My family and my husband’s family did. My grandmother was a lovely woman named Gertrude who hated her name and went by Trudy all her life. My mother argued tooth and nail against naming my daughter “Gertrude” and only begrudgingly accepted Trudy and only after she’d arrived. My mother preferred Grace which, while lovely, is not to my taste. While I was pregnant, my husband’s grandmother died. I impulsively said to my mother-in-law that I’d like to name the baby for her mother if it’s a girl. Her name was Joan and while it’s a nice name, it’s just not one I wanted to bestow. I settled on Josephine which felt to me like an elaboration on Joan and flowed better with our last name. They’d never say anything about it, but I get some side-eye over that middle name choice. I love my little girl’s name. I feel like it’s spunky and something that can grow with her, I also love that she’s carrying her great grandmothers’ spirits into the twenty-first century. I think you meant Norman Rockwell, not Rockefeller. HA! Yes, Rockwell. Thanks for that. And excellent point – there’s always someone who can argue, and when it comes to family names, it’s often our families who do just that! There are a few family names I would love to use, but my list of names I love is really long. If I could have 20 kids, or give my children 5 names a piece it would be fine, but that is not going to happen. At this point I love the idea of family names, but I have no idea whether or not I would actually use them. #6 all the way! It narrowed down the playing field to a much more manageable list, especially since the same few names repeat so often in each of our family trees. I sort of like the fact that our children will have names that you find at many different points in our personal histories. 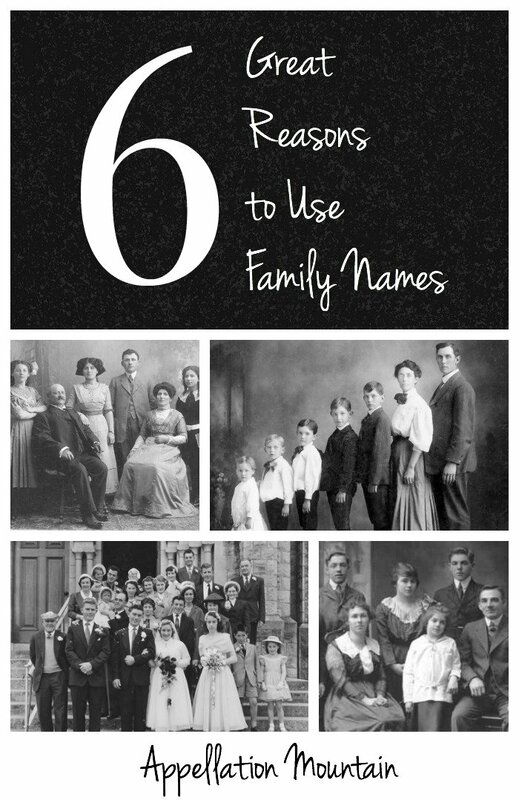 For me, family names are a chance to honor the collective group that led to you. Honor names are about recognizing a particular person. I probably wouldn’t use family names for a first name, but I would absolutely use them as middles. There are two family names on my mom’s side that I’d happily use: Frances for a girl and Jesse for a boy. I haven’t found any I truly love on my dad’s side yet, but I’m sure once I start having kids I’ll look into that more. Fingers crossed that my future husband has good names on his side as well! I’m also planning to use Maren as a middle name after my grandma Mary. I love when people use family names, but for me, I prefer them in the middle spot. My SO is William Augustus Lastname III. He has hated it all his life, because Williams 1 &2 were around, and he never felt like he had his own name. My dad is also named after his father, my grandpa is Warren Oliver (Oliver is also a family name! His mother’s maiden.) and my dad is Warren Wayne. My dad doesn’t care for his name, but I don’t think it’s because he’s named after his father, I think he just doesn’t care for Warren. I guess the experience of people being a direct namesake varies a lot! For myself, if we were to use a family name I’d want it to be someone no longer living or in the middle spot. Or maybe a sound-sharing name that isn’t exactly the same (like Marlene and Marlaina, they each have their own names, but they’re definitely related) I’m partial to Jocelyn to honor my grandmother Joyce.